On Chinese New Year's day, you're not supposed to do any cooking, which means that you just eat leftovers. There were some of the dishes we had at dinner (chicken curry and duck soup), plus a huge tub of pasta salad primavera which I'd made for a picnic concert thang, the boiled whole chicken and the almond cookies. We are still working our way through them. 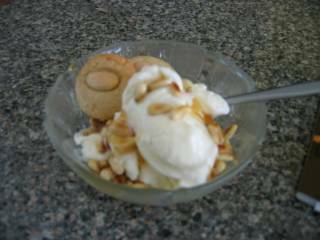 On New Year's day, for pudding at lunch I had some almond cookies, on the side of a scoop of vanilla icecream with honey and toasted pinenuts. Such a dreamy combination. Yes, it's out of focus. But it tasted so good! Yesterday Dad also bought a couple of roast ducks to add to the soup, and to eat plain... there's still a lot left. As delicious as all this food is, I can't wait for us to finish it so we can start cooking new things! Excluding breakfast, I've had that pasta salad five meals in a row! !